Since the vinyl is "perforated", it allows air to flow freely through it greatly reducing the impact wind has on the banner. This makes it perfect for use outdoors, as your target audience is able to see the banner visibly without flapping around in the wind. It is also lightweight so it is easy to mount in place. 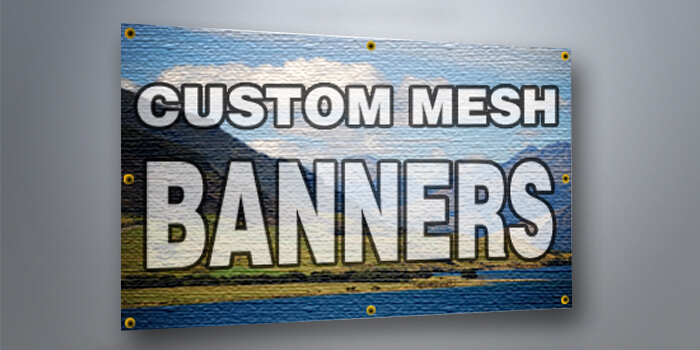 Our mesh banners are printed on 8 oz vinyl and allow 37 % airflow. The standard finishing option for vinyl banners is hems and grommets. Hems consist of one inch of the vinyl banner material folded over to the backside of the banner and heated together to form a clean and strong one inch hem. The hems increase the strength and durability of the banner. Grommets are made of #2 brass rings. Grommets are about 1/2 inch in diameter. They are placed every 2-4 feet around the banner perimeter and are used to help hang the banner. We recommend using all of the grommets provided when you hang your banner to prevent the banner from tearing or ripping.